Cappadocia is another one of Turkey’s most amazing natural wonders. Found right in the middle of Turkey, this natural destination is what can only be described as incredible. An extraordinary meeting of nature’s artistic splendour and the intelligence and invention of the human mind – Goreme is a landscape that cannot be forgotten. Will rolling rock formations, caves and soaring peaks, the people of days gone by saw a unique and beautiful landscape that they had to call home. Walking around Goreme, you soon discover curious manmade crevices, that lead to rock-cut churches and doorways to mysterious underground cities. These ancient builds from the Byzantine era, are both unique and spectacular. The traditional human habitats of the past have this time been carved out and into the eroded landscape, with evidence of human habitation dating back to the fourth century. Believed to be formed partly due to the ancient activity of the volcanic mountain of Erciyes (which is now dormant) and partly due to the harsh sandy winds, eroding the soft rock to create a flowing, rippling landscape that is one of a kind. Steep pillars jut out into the sky and are often referred to as the ‘fairy chimneys of Cappadocia’ or hoodoos in the local dialects. 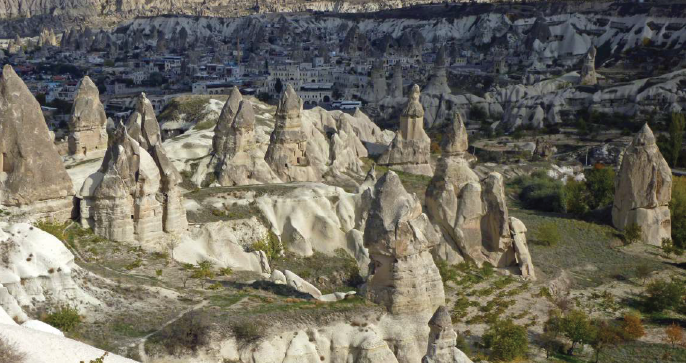 Goreme is a national park and despite being protected now, has been used, re-built and modified by man for centuries. It is an amazing example of how nature and man once lived in much more harmony than today. Apart from some natural earthquake damage however, the landscape is very much still intact, and with the continuing erosion from the sharp winds, it is expected that new formations will be created, with new pinnacles and caves carved out over hundreds of years. While visiting Goreme, another UNESCO world heritage site, make sure to pay the Goreme Open-air Museum a visit, an essential stop and any itinerary. Found of the location that is believed to have once housed some twenty Byzantine monks and acted as a pilgrimage site from the 17th century – the artwork, handicraft and architecture can still be viewed in all its glory, preserved over time. THE CITY OF CAPPADOCIA IS WELL SUPPLIED WITH A RANGE OF HOTELS, CAMPING SITES AND OTHER ACCOMMODATION OPTIONS, ALONG WITH A WIDE SELECTION OF RESTAURANTS AND ENTERTAINMENT VENUES. THIS MOONSCAPE OF A LANDSCAPE IS ONE NOT TO MISS ON YOUR NEXT ADVENTURE TO TURKEY. A PLACE FILLED WITH AWE, ALLURE AND WONDER, THIS STUNNING SETTING IS BOUND TO MAKE ANY VISITOR DROP JAW AND JUST EXPLORE WITH EYES OF ADMIRATION. The Adiyaman Province of Turkey is still regarded as a rural province, with poorer communities and still very much in development. But if you were to visit the province, you would soon find a wealth of beautiful pillars of yesteryear – a graveyard of beheaded gods on the top of a mountain almost forgotten. This magnificent historical site found on the eastern Taurus mountain range is known as the 8th wonder of the world – remaining host to the beheaded images of Greek and Persian gods and their resting place after the decline of the Kingdom of Commagene. It was built as a tomb and mausoleum of Antiochus I, and is described as one of the most ambitious construction of the Hellenistic period. The eagle head is well known to be one of the most intriguing and incredible carvings that have lasted the test of time. Although not worshiped these days, the gods still look over the lands of ancient times, lasting 2000 years up on the mount. 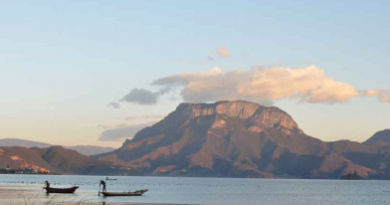 This mount looms across the entire surrounding territory, some 2200 metres high, with views of a kingdom now forgotten, and a river that still runs true. The whole mount is been given UNESCO world heritage status since 1987, as it offers rich cultural heritage to the area, and is part of the impressive and unique landscapes of southeastern Turkey. Originally, the gods were of course not beheaded, but as times changed and beliefs, kingdoms and rulers changed, those with new ideas and control sought to destroy the current gods in place of their own. By beheading the statues, these gods were denied their reign, but were not forgotten. Many years after, it is believed that archaeologists were the ones to re-discover the mountain of gods and place the heads upright, where they once lay strewn for hundreds of years gathering sand and slowly being eroded in the sharp sandy winds. THESE RUINS, ALONG WITH A TOMB SANCTUARY FOR ANTIOCHUS I, ARE MAGNIFICENT TO BEHOLD, EVEN TODAY. 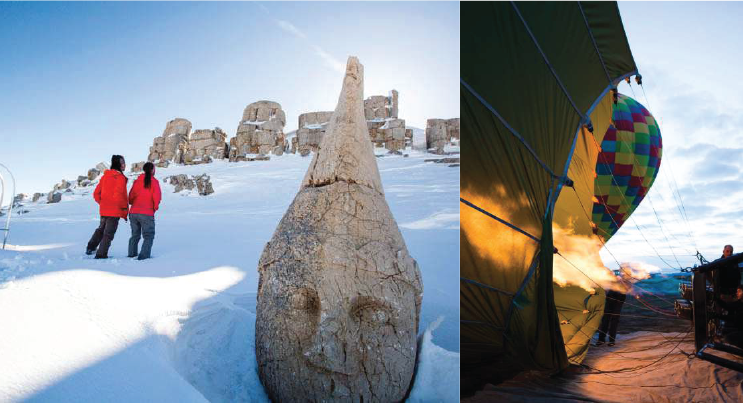 THE BEST TIME TO VISIT IS BETWEEN APRIL AND OCTOBER, AND VISITORS CAN STAY IN THE NEARBY TOWN OF ADIYAMAN. BUS TRIPS GO DAILY, BUT YOU CAN ALSO RENT CARS OR TRAVEL PRIVATELY IN HELICOPTERS IF YOU PREFER. THERE ARE ALSO TOURS RUNNING OUT OF MALATYA OR KAHTA IF YOU PREFER THE COMFORTS AND RELIABILITY OF AN ORGANISED TOUR. Another wonder of the city of Pamukkale in the Denizli Province of southwestern Turkey, apart from the impressive Roman theatre and sacred hot springs, is what is commonly known as the cotton castle, another part of the curious water lows of the area. The name comes from the white, cotton like appearance of the mineral bath spas, laced in calcium overlooking hillsides and the ancient roman city. Despite being a small town, it has a big name within the tourist circles of Turkey. Many years ago the Romans and the Greeks discovered the strange area, and immediately set up a city and a sacred bath, believing the hot spring and sacred steam to be a gateway to the underworld and the home of Pluto (Hades in Greek belief). 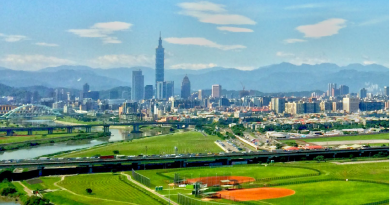 In addition to the manmade structures that encompassed the main hot spring, a more natural structure existed, which has now also earned UNESCO World Heritage status in the 1970s. The famous terraces are made from the lowing of high mineral content water, bubbling from hot springs deep underground. The while cotton like terraces are made of travertine, carbon based minerals that have been left by the lowing water for thousands and thousands of years. The structure itself is 2,700 metres long, 600 metres wide and 160 metres high. THE ALMOST CANDY LIKE APPEARANCE IS SOMETHING LIKE A CARTOON OR A NEW TREAT FOUND INSIDE WILLY WONKA’S CHOCOLATE FACTORY – BUT IT IS INDEED A PLACE MUCH MORE IMPRESSIVE. EXPLORE THE COTTON CASTLE, BATHE YOUR FEET IN THE WARM SPRING WATER AND ENJOY A REALLY ALIEN LIKE BACKDROP OF PURE WHITE. WHEN YOU ARE IN PAMUKKALE, BE SURE TO VISIT THIS NATURAL FORMATION. A PLACE MANY WOULD SAY IS EVEN MORE IMPRESSIVE THAN THE ROMAN STRUCTURES IN TOWN. 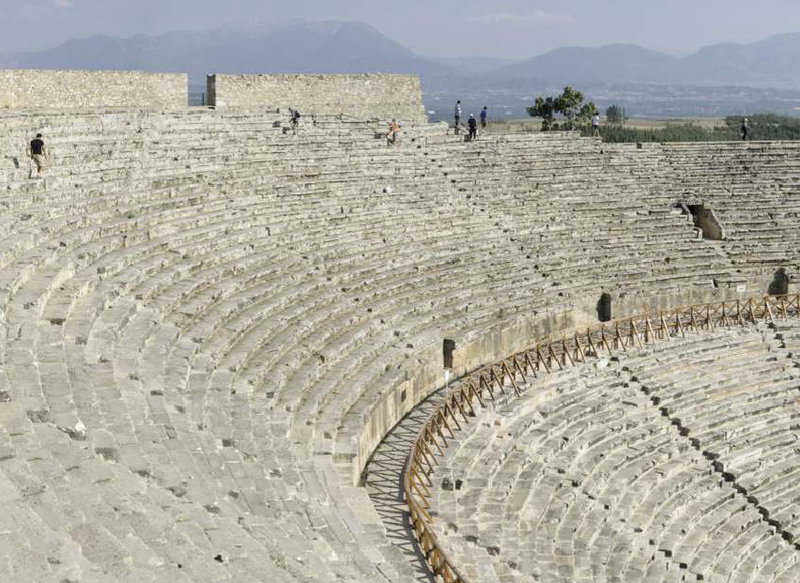 Despite being a small town, it has a big name within the tourist circles of Turkey. Many years ago the Romans and the Greeks discovered the strange area, and immediately set up a city and a sacred bath, believing the hot spring and sacred steam to be a gateway to the underworld and the home of Pluto (Hades in Greek belief). In addition to the manmade structures that encompassed the main hot spring, a more natural structure existed, which has now also earned UNESCO World Heritage status in the 1970s.The famous terraces are made from the lowing of high mineral content water, bubbling from hot springs deep underground. The while cotton like terraces are made of travertine, carbon based minerals that have been left by the lowing water for thousands and thousands of years. The structure itself is 2,700 metres long, 600 metres wide and 160 metres high. When thinking of Turkey, many would not believe it when presented with the fact that it is a popular destination for winter sports – and Mount Erciyes is one of the best places for those interested. Gear up with some walking boots and a backpack and adventure upwards or, for those who enjoy a bit more speed in their step, head to the top, clip on some skis and shoot down the mount. With an elevation of almost four thousand metres, the summit is almost always covered in snow and fog. The mount is in fact not a mount at all, but a dormant volcano that looms over the city of Kayseri to the north. Historically, Mount Erciyes was a bubbling hot lava illed volcano, and has been attributed to the ‘fairychimney’ rock formations in the nearby city of Cappadocia. Once a centre to the communities living there, the lava and volcanic dust proved incredibly fertile and was revered so much that in ancient civilisations, they even depicted the billowing volcano on their coins and in their artwork. As are many places in Turkey, Mount Erciyes is steeped in history and society, with historic writings and symbols found on the summit. Although the irst successful climb to the summit was by WJ Hamilton in 1837, it is widely regarded that locals once traversed the rocky outcrops and made it the the summit many many years before those in the early modern era. The best time to climb is from late spring to early autumn when the snows are less and the weather is calmer, but for those wanting to ski, obviously it is the winter months that are the best. However, as the mount is an exposed mountain, the snow storms can be quite hazardous, so there are constant warnings and study of the summits and mountain tops to ensure any visitor, weather you are skiing, climbing, hiking or just taking in the breathtaking views, are safe at all times. One of the more dangerous aspects of the mount is the risk of falling rocks, so most climbers, cross country skiers and adventures are advised to wear helmets. The nearest airport to the mount, and it’s neighbouring city Cappadocia, is the Kayseri International Airport, which has busses and transport links directly to the mountain. There is also busses and other transport to the city from Istanbul. The mount is dotted with a number of ski centres, so take your pick before you go and book up to avoid disappointment. The northeast side of the mountain is recommended for those wanting to climb the mountain, as most climbs begin there. The highest lift line takes you up to 2700 metres, and stops very close to the Cobanini camping ground where those heading to the summit can rest before the last day. LIKE ANY SNOWY MOUNTAIN, THE WEATHER CAN BE HARSH, AND THE ENVIRONMENT CAN BE DANGEROUS, BUT WHY ELSE WOULD PEOPLE VISIT IF ITS NOT FOR THE THRILLS. FOR ANYONE VISITING TURKEY WHO ENJOYS ADVENTURE OR WINTER SPORTS, MOUNT ERCIYES IS MOST CERTAINLY THE PLACE TO BE FOR A UNIQUE EXPERIENCE, WITH BREATHTAKING VIEWS OF THE GLORIOUS COUNTRY SURROUNDING IT ON ALL SIDES. The second largest island of four found within the Lake Van in eastern Turkey is a location well worth the visit when exploring the vast and impressive country of Turkey. 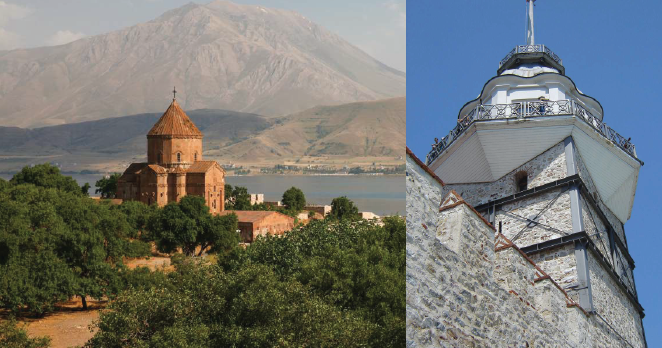 Not only is it geographically spectacular, but it is also famed for it’s Armenian church, showcasing some exquisite medieval Christian art. Constructed in around 920 AD, it has survived the test of time and religious conlict, and now marks one of the more vibrant eras of Armenian construction and artistic design. Visitors lock to the island to relish in the beautiful decor, such as detailed stone relief which has been described as truly unique, which depict both biblical stories and scenes of life at the time such as palace living and hunting animals. Turkish Museum Card it is free. FOR THOSE WHO ENJOY NATURE IN IT’S BEST SETTING, PITCH UP YOUR TENT IN ONE OF THE MANY CAMPING AREAS AROUND VAN LAKE, AND TAKE A STROLL ALONG THE COAST BEFORE SITTING DOWN AT ONE OF THE MANY IMPRESSIVE RESTAURANTS AND WATCH THE SUN SLOWLY SET, CASTING BEAUTIFUL ORANGE HUES ACROSS THE LAKE, MYSTIFYING THE WATER AND IT’S ISLANDS FURTHER, TAKING YOU BACK INTO A TIME ALMOST FORGOTTEN. Probably one of Istanbul’s most recognised landmarks, the Maiden’s Tower has been a place of intrigue and legend since the city began. 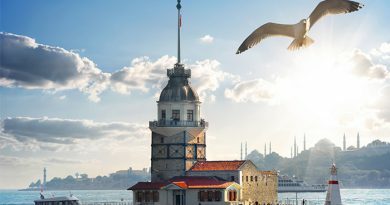 Believed to be built in around the 12th Century, then re-constructed in around the 18th century after it was previously destroyed by the Ottoman Turks, this tiny but impressive tower rests some 150 metres off the shore of the Slack district. It was used for many different purposes over time, such as a tax collection ofice, a lighthouse and a defence tower. In more recent times it was used to quarantine those plagued with cholera in the epidemic in the year 1830, then passed onto the Ministry of Defence before being publicly accessible, now owned by a private company today. Perhaps more compelling and exciting however, is the range of legends that surround the tower. Probably the most famous of which is where a sultan believed his daughter would be killed by a snake bike on her 18th birthday after witnessing a prophecy from god. As any father would, he tried to trick fate, and believed that if he took his daughter to the Maiden’s Tower, she would be safe from snakes and would survive. His daughter spent many days in the tower before her birthday came. At dusk on the fateful day, the sultan was so happy that she had yet to be killed by a snake and that the prophecy could in no way be fulilled, he sailed across to the tower to celebrate with his daughter. On the boat was a basket of fruit. In that basket was a snake hidden away. And just before the night of his daughters 18th birthday was over, she was bitten and then died in her father’s arms. Another prophecy told of a girl named Hero who lived in the tower and of a young man named Leandros who loved her dearly. Every night he would swim to the tower and spend the night with her, but on one fateful night, a storm rolled in and he drowned in the hard currents and swirling waters. When he washed up on the shore of the tower, the young girl name Hero was so distraught she threw herself from the tower and landed next to her lover, killing herself to be with him. These curious legends perhaps tell of why it is known as the Maiden’s tower, as it is a place of story telling and fair maidens who seem to all end their lives while they are still fair as the day is new. These days, the legends hold true, but the use of the tower is much less impressive. No longer are there fair maidens risking their lives out on the tower, but a restaurant now takes their place, where tourists can enjoy eating with beautiful views of the bay and relive the life of some of these maidens of legends.There is even a bar at the top of the tower – but throwing yourself off with grief is not advised. Shuttle boats depart every 15 minutes from a ticket booth near the waterside that overlooks the tower. It is especially beautiful at night.